1. Always purchase eggs from a refrigerated case. 2. Open the carton and make sure there are no visible cracks or leaking eggs. 3. Check the short end of the carton for the date the eggs were packed as well as an expiration or sell by date to make sure the eggs are fresh. 4. Look for the United States Department of Agriculture grade shield or mark. Once purchased, it’s also important to follow these safe food handling practices to ensure egg safety and quality. • Keep eggs in the coldest part of the refrigerator, not the door. Storing them in the refrigerator door could result in temperature fluctuations that can lead to bacteria growth. 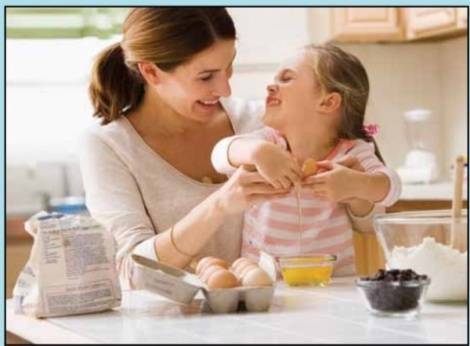 • Eggs may be refrigerated three to five weeks at home. The sell-by date will usually expire during that time, but the eggs are safe to use for four to five weeks beyond the expiration date as long are they are kept in a refrigerator set at 40 F.
• Wash hands and utensils after coming into contact with eggs to avoid cross-contamination. • Cook eggs thoroughly. For scrambled eggs and similar dishes, cook until no visible liquid remains. Fried eggs should be cooked until the whites are completely set and the yolk is thickened but not hard. • Serve eggs and dishes containing eggs promptly after cooking. Does Hen Housing Affect Food Safety? To better understand how different hen housing systems may affect food safety and other sustainability factors, the Coalition for Sustainable Egg Supply recently completed a three-year research study. The study compared flocks of egg-laying hens in three different types of housing systems: conventional cage, enriched colony and cagefree systems. As consumers are becoming more interested in the type of environment in which animals are raised, the coalition elected to conduct research in order to develop sciencebased information to use in supporting informed decision-making. The research found that with proper management, eggs produced in any of the three different housing systems are safe and of comparable quality, but also accompany a variety of positive and negative aspects across other elements of sustainability. Check out sustainableeggcoalition.org for more information about sustainable egg production, videos, interactive infographics and the CSES research results.